Historic events have unfolded in Fukushima, Japan. Many experts believe the scale of this tragedy to be the greatest nuclear tragedy in history. Leadership in Tokyo and the world need to recognize that this nuclear crisis is not a passing event in one distant part of the world. Unless the leaders from all sides of humanity go to work, the consequences of four “melt downs” will have deep consequences not only for the population of the Prefectures around Fukushima, but the surrounding countries of Korea, China and Taiwan and the world. 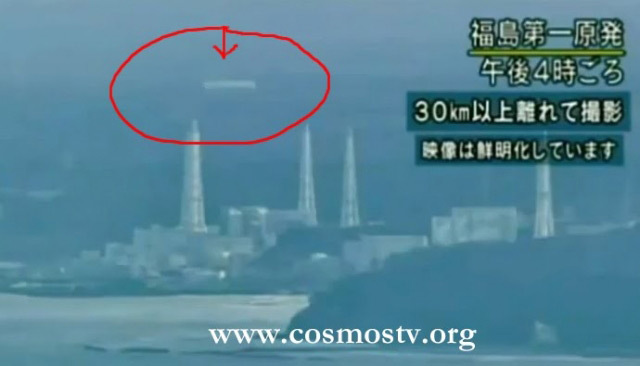 It is also important to acknowledge the presence of a score of unusual light objects coming from unknown sources that appeared over the Fukushima plants shortly after the March 11th disaster. These aerial patterns coming from these objects in the sky are mystifying as you can see here in the short film clip (March 26, 2011) and represent something more than the “Olympic of the Mind” or double-vision ignored by the official media. Although many are critical of unknown lights, their timing was important for after the March 11-16 initial crisis, March 21-26th was a second real turning point for the dangerous nuclear by-products especially from Reactor 3 containing MOX, the most dangerous of all the fuels. In fact, the world may find a way and means to use new energy sources as we observe advanced cosmic cultures who are watching the energy dilemma we earthlings are facing at this critical time. –J.J. Hurtak, Ph.D., Ph.D. and Desiree Hurtak, Ph.D.